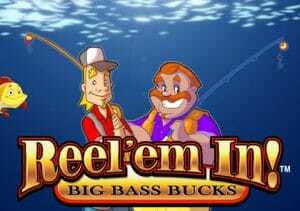 Trying to land a bumper catch of coins is the goal in Reel ‘Em In: Big Bass Bucks, a fishing themed video slot powered by WMS Gaming. It comes with a quartet of features that award a range of cash and multiplier prizes. Cast off from between 20p and £100 per spin. All of the cartoon imagery in Reel ‘Em In relates to angling so look out for hats, floats, bait, rods, tackle boxes and yellow and blue fish. 5 of the blue fish will get you a payout of 50 times your total stake. Fishing Hole feature – land 3 lure scatters to trigger this 1 then choose 1 of the fishermen on screen and an area of water. The fishing line will hit the water and you’ll be awarded a prize depending on the type of fish you catch and how many lures triggered the feature. Awards of up to 27 times your stake can be had here. You can also trigger one of the other features from this round. Fishing Contest feature – to trigger this one, you’ll need to land 2 lures plus the Fishing Contest Lure on reel 5. You’ll then take part in a fishing competition and given 5 casts to collect some cash bonuses. As in the Fishing Hole contest, the exact size of prize depends on how the feature was triggered. Awards of up to 50 times your total bet are possible here. Big Bass Fishing Hole feature – land 2 lure scatters plus the Big Bass Fishing Hole scatter on reel 5 to land this one. Pick a character who’ll reveal how many picks you’ve been awarded. Make your picks to reveal cash prizes which this time can top 55 times your stake. Fly Fishin’ feature – this is triggered when the fly symbol appears above reel 5 and the big bass symbols hits below. You’ll then be awarded a random bonus of 4, 5, 6, 7 or 10 times your total stake. You’ll have no doubt noticed that there aren’t any free spins on offer here – the pick me bonuses are a decent enough substitute can be a little repetitive and dull. We’d certainly have liked to have seen some free spins added to the mix though. Visually, Reel ‘Em In is nothing to write home about and the features aren’t particularly ground-breaking. This is basic, low medium variance fare. It’s unlikely you’ll land a whopper of a catch here but get lucky with the bonus features and it’s still possible to reel in a decent haul if the fishing gods are smiling. I recommend you try IGT’s Lucky Larry’s Lobstermania 2 which has a similar theme but is a better game all round.